A woman who referred to herself by the first name of Alana, held a sign outside the ARC bookstore today to protest the Dakota Access Pipeline. Protests in North Dakota near the Standing Rock Indian Reservation has drawn international attention in response to the people who are protesting the pipeline construction. Alana, who refused to give out her last name for fear of being threatened or harmed in the future due to her protest, said her motivation was to make students aware of what is going on. A recent CNN video showed law enforcement officers firing rubber bullets, tear gas and high pressure water at the crowds protesting the Dakota Access Pipeline on Sunday. “Police had thrown a concussive grenade into the crowd and it hit her arm and blew a part of her arm…she had to get it amputated off,” Alana said about the news coverage of the pipeline protests. ARC students and spectators Joe Shannahan, James Wilde, Abdul Hamid, and Dalton Douglas-Hiley had their own responses about Alana’s protest. Alana decided to hold her protest today because she wanted to leave students with something to think about over Thanksgiving break. Joe Shannahan reacted in support of what Alana was accomplishing as she held her sign in protest. James Wild, commenting on the protest said it was strange to see the sign, but he understood the purpose. “Curious would be my first reaction after I read it,” said Wild. He expressed his appreciation of living in a place where we can express our opinions. Many students who were curious about the sign, came up to Alana to talk to her and question the purpose of it. “A few women have come up to me, and pretty much every response has been positive,” Alana said, also commenting that her protest could benefit others. Shannahan, along with three other men at the scene also commented to Alana’s protest. Although Alana’s protest was brief, by standing up and raising awareness to the event happening in North Dakota, she demonstrated that students have a voice on campus. 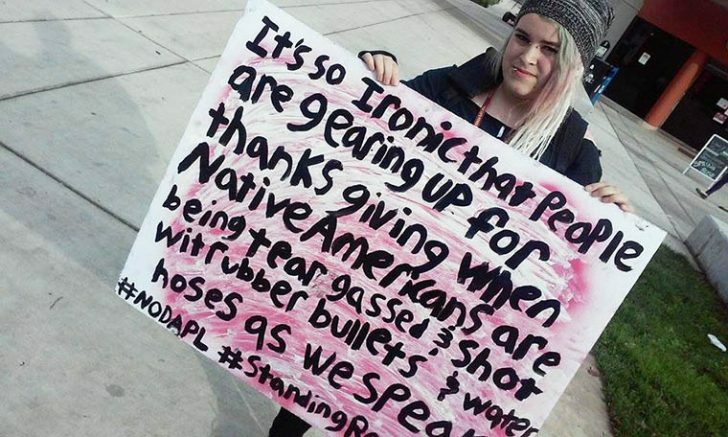 Alana said that although she is not a native person who is being affected by what is happening, this was not her first time protesting. “This isn’t the only one, it’s just specific because Thanksgiving is coming up,” Alana said. Alana said that she has protested for Gay Pride and the Anti-Trump rally’s. She plans to travel to North Dakota in the summer and offer whatever help she can. “I’m actually heading down to North Dakota once finals are over to try to bring some supplies over to them, even though I’m (just) going for a weekend… I’m trying to donate what I can,” Alana said. 1 Comment on "Student holds protest against Dakota Access Pipeline"
Wow! Impressive. This is an example of how ONE person can change the world! God bless you, Alana! You are truly transforming the evil on this planet with your goodness; you are the change in the world.